Price’s Alarms offers patented security and interactive technology to provide best in class protection and the ability to monitor your property 24/7 from just about any smartphone available. Price’s Alarms utilizes advanced interactive security solutions to provide the most reliable home and business monitoring service. Don’t let all of the features scare you, while alarm.com is certainly the most comprehensive full-suite of interactive products ever tied to security, it can also be very simple as an effective way to engage with your security alarm. Read on or call Price’s Alarms to find out why Alarm.com will make you fall in love with the control you have right from your smartphone. Apps created for the latest in technology such as iPhone, iPad, Apple Watch, Android phones, Pebble Watch, Windows Phone, Blackberry, the Amazon Kindle, and Amazon Fire TV. Get true peace of mind with better security and property awareness, Arm and disarm your system, and get email and text notifications all through your smartphone. Take Control of your energy use to save money without sacrificing the comfort. Remotely adjust your thermostat and lights, use the schedules customized to fit your lifestyles, even use geo-services to automate control based on your comings and goings. Dedicated Connection – Stay protected and connected, even if the phone line is cut, the internet is disconnected or the power goes out. Crash and Smash Protection – Our technology protects you from an intruder destroying your security panel by sending an alert at the first sign of entry. Locks – Integration of door locks with your alarm.com security system allows for remote door lock control. Real-Time Alerts – Receive text or email notifications when these is almost any activity at your property. Different notifications to different people, during different days of the week or even during specific hours. 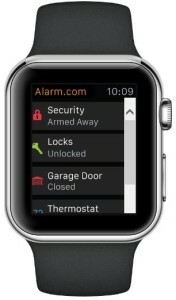 Alarm.com offers the very best in alarm system notification! Mobile Apps – Free mobile apps with intuitive technology keep you connected and in control. Integrated Solutions – Price’s alarms integrates all your services into a single connected solution. Use customized triggers to connect your security system with your locks, lights, and thermostats to get the most highly personalized automated solution all in one place. Geo-Services – Automatically adjust your thermostat and lights based on the location of your smart phone to save energy while you’re away. Set-up notifications, so you’ll know if you’ve forgotten to close the garage, lock the door, or arm the security system. Customized Triggers – Make the system do the work for you. Use connected sensors and devices to automatically trigger activity. For example, when you disarm the system the hall light can turn on and thermostats automatically adjust. How it works Example: Simply by disarming your system, you can create a customized trigger that automatically unlocks the front door, turns the living room lights on and adjusts the thermostat to a comfortable temperature. Live Streaming – Check in whenever you want from your smartphone, tablet or computer to get a view of what’s going on. Record Video – Capture motion or event-triggered video clips, making it easy to find exactly what you want to watch later. Video Alerts – Get video clips sent directly to you via text or email when the front doors opens, the alarm goes off or when motion is detected. Thermostats – Remotely adjust your thermostat via the web or alarm.com’s mobile app and set thermostat schedules so you save money. Remember, a regular thermostat doesn’t know every moment you are home or away – your security system does and this integration will save you money! Smart Schedule – Create custom energy-saving schedules for your home or business to automatically adjust the temperature so you’re not wasting energy when you are away. Stay in charge – Price’s Alarms can send you immediate alerts via text or email to notify you when someone unlocks the door. You’ll know who entered your property and when. Plus, suing Price’s ALarms automation solutions you can have the doors lock whenever the security system is armed or unlock when the system is disarmed. Remote Control – Arm your security system and control all of your connected devices right from the palm of your hand.